Yesterday the peregrine falcon drama in Rochester, New York went over the top in a twist so incredible that you wouldn’t believe it if you saw it on TV. The story has a Pittsburgh connection — the two females are the daughter and granddaughter of Dorothy, the matriarch at the Cathedral of Learning — so I’ve been watching from afar. I’ll try to replay it here. Hold onto your hats! You may remember last year’s Peyton Place when Dorothy’s daughter, Beauty, and her granddaughter, Unity, both attempted to nest with the same mate, Archer. He shuttled from Downtown to Kodak Park trying to keep his “wives” happy but neither nest was successful. In the months that followed Unity repeatedly challenged Beauty for the main nest site at the Times Square Building. Archer was out of town on February 10 (he migrates) when Unity beat up Beauty and sent her to rehab. With Beauty out of the picture and Archer still away on migration, Unity was courted by several males. She refused their offers and when Archer returned on March 14 he chased them all away. Unity was on the verge of laying her first egg when Archer lost a battle with another male on March 26. He returned to the nest to show Unity his condition but he was so badly injured that he couldn’t stand up! He faded into the background to nurse his wounds. 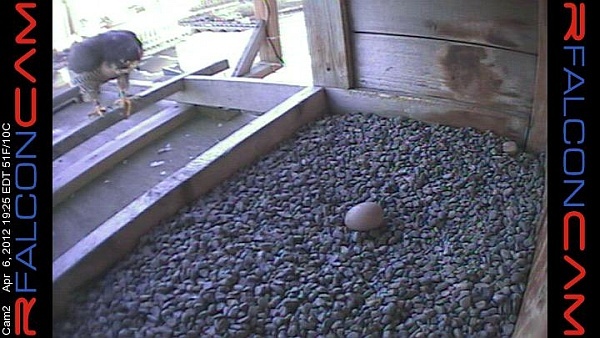 Three days later, on March 29, Unity laid her first egg. If things had been calm she would have laid her second egg on March 31, but with an injured mate and unknown male victor she stopped laying eggs until she got to know the new guy. Meanwhile, Beauty had fully recovered. On April 2 she was released at Montezuma Wetlands Complex. Everyone expected her to fly home to Rochester, only 50 miles away. That was the last day anyone saw Archer. Unity died yesterday. She was struggling with a pigeon and landed on the street where she was struck and killed by a car. Beauty came home last night! She was gone almost two months, unaware of the drama that occurred in her absence. She vividly remembered her rival and the territory she lost in February. She returned, wondering where Archer was and obviously wary that her rival would appear at any moment. At 7:25pm she approached her nest and Lo, what is this? An eleven-day-old egg! Just one. Whose egg is this??? What happens today is anybody’s guess. p.s. Follow the latest developments here on Rfalconcam. Is this daytime TV? You could call it, “As the Egg Turns”. Others might have better names for this soap opera. That about sums it up, Kate. A-May-Zing! Beauty was in the nest box this morning and DotCa has been swooping at her. What a sight to see on the camera! Beauty was battling with a SubAdult female this morning that DotCa seems to be fond of. She appeared the same day in Rochester as he did and likely came with him as Unity was seen chasing her out as well. Today she returned with a vengence and so far Beauty has survived attacks by both her and DotCa. The subadult flew out a few hours ago – no apparent victor and now B and D seem to be taking turns swooping on each other. I dont’ think this is going to end well. Enter a 3rd falcon today, a sub adult who is battling Beauty and DotCa joined in. Beauty is sitting at Kodak Tower waiting her next move. Can it get any worse??? Kate – was just reading the falcon watch blog..I read that 2 peregrines were chasing a Canada goose! A goose seems awfully big for a peregrine to catch…do you agree? Maybe just chasing it out of the territory?